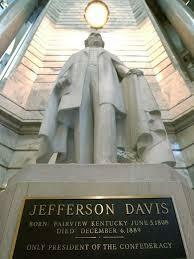 Should Muhammad Ali Replace Jefferson Davis in Kentucky Capitol? An effort is underway in Kentucky to replace a statue of Confederate President Jefferson Davis in the Capitol Rotunda with a tribute to boxing legend MuhammadAli. Lexington attorney and former State Treasurer Jonathan Miller has begun anonline petition seeking the change. Miller says Ali’s recent death has more people talking about his place in history. "People have been reminded that he wasn't just a boxer, but indeed made a profound influence on American policy," Miller told WKU Public Radio. "They've also been reminded that he's a Kentuckian. He was born here, grew up here, and will rest in peace here." So far, about 600 Kentuckians have signed the petition which Miller plans to deliver to Governor Matt Bevin and legislative leaders. While several lawmakers supported an attempt to remove the Davis statue from the Capitol last summer, the state Historic Properties Commission voted to leave the statue in place.